The Palazzo, almost in the form of a square castle, silently and solemnly dominates the small world that swarms at its feet. Erected at the beginning of the 16th century as a country house for the abbot St. Angelo of Atella, Giovan Francesco Carafa, it was then handed to his nephew, the Prince of Stigliano, who had the honour of having Tarquato Tasso as his guest. 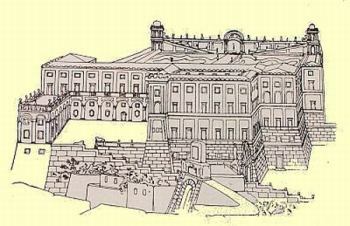 The first architect to undertake renovation work on the building was Ferdinando Manlio, whose designs owed a great deal to his work as a military engineer, which explains the adoption of a layout much like that of the Viceroyal Palazzo and Castelcapuano. The building was once surrounded by beautiful gardens, considered by foreign travellers as the most beautiful in Naples, of which unfortunately little remains today. In 1548, Luigi Carafa appointed Giovanni Merliano da Nola to design a fountain for the lower garden that still exists today. In 1647, the palazzo was so heavily attacked by Masaniello rebels that pieces of artillery were put into place for its defence and, during the terrible plague of 1656 the monks from the small nearby church of St. Orsola used it as a quarantine hospital. 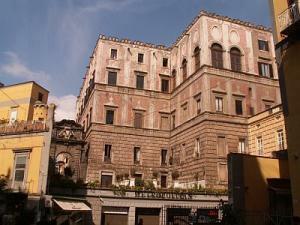 After the death of the last descendant of the Princes of Stigliano, Nicola Guzmán Carafa, the palazzo, the feuds and other assets were confiscated. In 1696, Antonio Giudice, Prince of Cellamare and Duke of Giovinazzo, bought it for 18,000 ducats and assigned Giovan Batista Manni to carry out restoration after which the building substantially assumed its present aspect. The architect made a new and magnificent staircase modelled on the one in the Royal palace by Francesco Antonio Picchiatti, his collaborator if not his master. However, work remained at a standstill for a long time because, as Antonio Giudice participated in several wars, he was away from Naples for a long period. In the second decade of 1700, the young and soon to be famous architect, Ferdinando Fuga , built the chapel of the Virgin of Carmel (completed by G.B. Nauclerio in 1729) inside the building and the entrance portal and formally unified the lower order of the façade with a rusticated cladding. The entrance arch goes back to the Neapolitan Baroque tradition and is characterized by vases embellished with mascarons and hanging drapes and two volutes with a shell in the centre; the coat of arms over the arch is in marble with large hanging festoons, similar to the one on the Chapel of the Virgin. The portal of the inner court, however, sculpted in piperno, was sculpted by Ferdinando Sanfelice at the very beginning of the 18th century. Antonio Giudice left his only daughter as the sole heiress, who married Francesco Caracciolo, Prince of Villa; but in the second half of the 18th century the building became the home of the most brilliant gentleman of the time, don Michele Imperiali, Prince of Francavilla. He redefined the interior decoration with frescoes by Fedele and Alessandro Fischetti, Giacinto Diano and Pietro Bardellino and invited famous personalities of the times, such as Casanova and Goethe. The Prince of Francavilla died without leaving any heirs and after various vicissitudes the palazzo was returned to the descendants of Cellamare. While rented out to the Court, among those that stayed in the palazzo before it was returned to its legitimate owners were the artists Angelika Kauffmann and Philipp Hackert. In 1805, it was again confiscated, this time by Gioacchino Murat, and only after the Restoration was it returned to the heirs, Caracciolo Giudice, Princes of Villa and of Cellamare, whose descendants still live in the palazzo today.